Hidden bottle of scrolls by a bench above Romero. 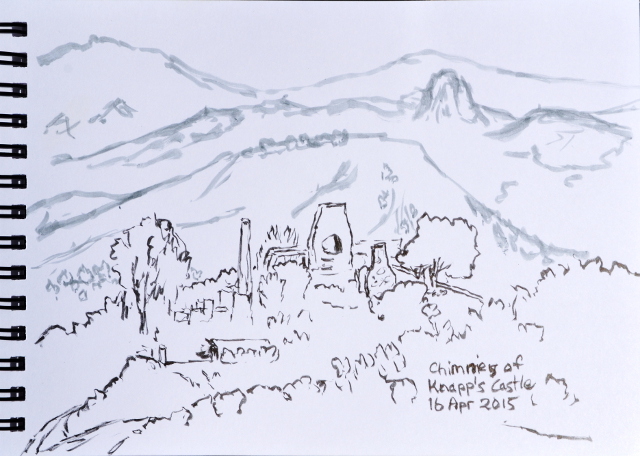 Up along Camino Cielo on a lovely day, checking out the "castle" ruins from a random old road cut. 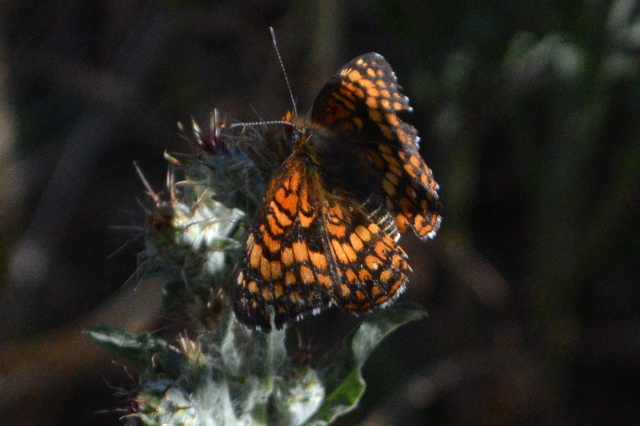 Along the road above Montecito. Bella Vista, I think. 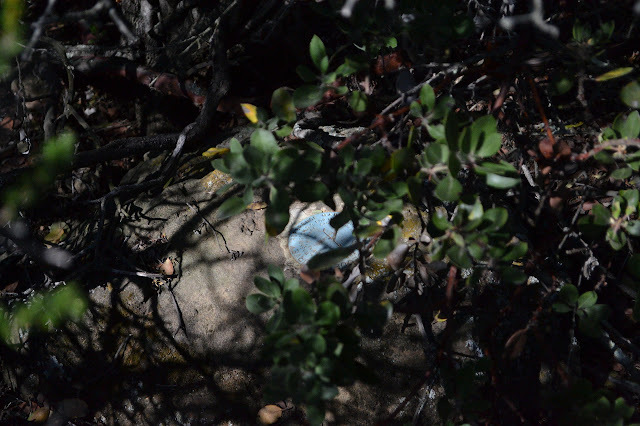 An ice can in Blue Canyon Camp evicted from its concrete base. Arriving at Middle Lion before 7 AM on a Sunday makes it hard to find a parking spot near the trailhead. The campground is full and active and cold. I forget how cold the microclimate of this canyon can get. There is a fair amount of jumping while waiting for Mark who underestimated his travel time by about 10 minutes. I go to grab my hiking sticks, which turn out to be... on Baldy? Actually, they probably found a new owner by this time the next day, knowing that trailhead. (I asked Pavel if he might have seen some about. He said no, and that he once let someone use a single pole on the way down. It was left by the gate and already procured a half hour later.) I really like to have my sticks if hitting the 10 mile mark, and today should be 20 miles. Mark lightens his own pack by one pair of sticks, which he carries but rarely uses, and we are off, around the campers beside the trail, across the creek, and climbing gently. 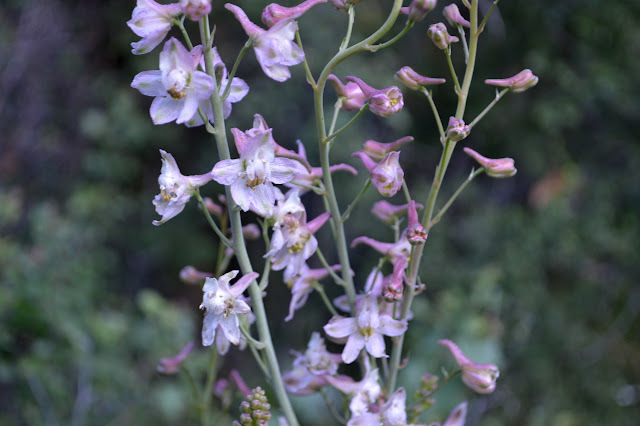 Many of the flowers here seem to be a much lighter version, like this delphinium (larkspur) that would usually be found in a very deep blue. 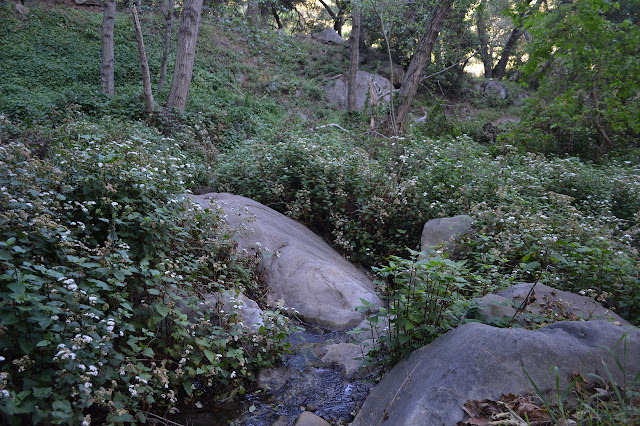 Water is flowing well in the creek when we cross it, but further up the creek is dry, then flowing again. It makes it hard to know if we want to check out the waterfalls or not. We decide not. Lion Canyon is flowing, but not everywhere. Bernard went up Baldy (formally known as Mount San Antonio) last year on his birthday and has been wanting to go again. I was up it once, but that was more than 10 years ago before I had a digital camera to easily document when. Maybe 2003. The weather looks uncertain, but so it goes. Everything is thick with clouds, but we break through them just before parking. There are more clouds above, but they are far above the tallest mountain in the San Gabriels. 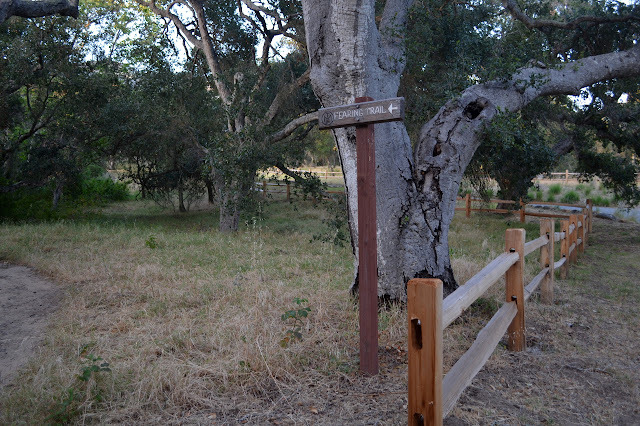 Once packed and ready, we squeeze past a sturdy gate with maps and start up the road toward San Antonio Falls. There is a good view of them along the approach, but the clouds move with us as we take the little trail to the base so that we cannot see them up close. The clouds open up again as we leave. 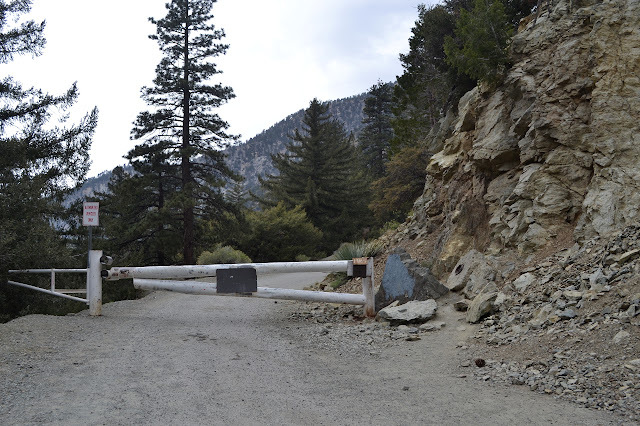 Start hiking up the gated road to get to the top. 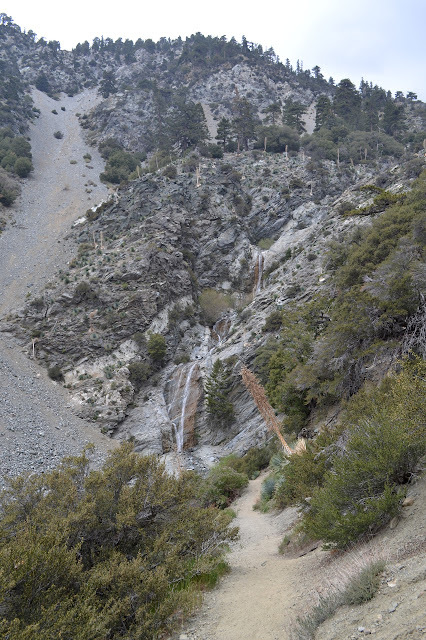 San Antonio Falls tumbles down a steep canyon from Baldy Bowl above. Romero Trail is quite well known along the canyon it is named for, somewhat less known as it climbs down into Blue Canyon from Romero Camuesa Road, and somehow even less known as it goes over the top between its meeting with Camino Cielo (in this spot, a narrow and poorly known trail itself) and Romero Camuesa. 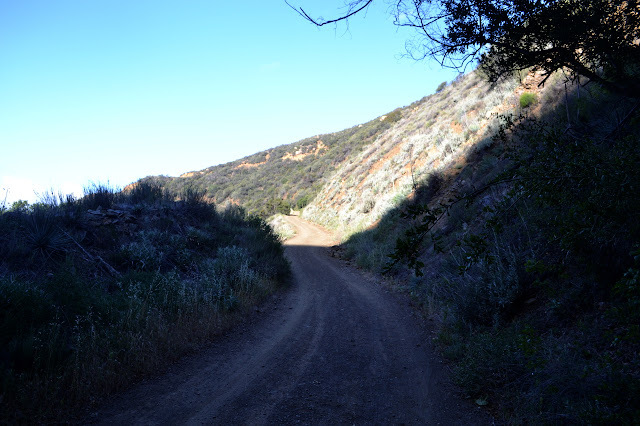 People often walk or ride Romero Trail with the long closed Romero Canyon Road in a giant figure eight, never actually realizing that they cut across on Camino Cielo back to the saddle. 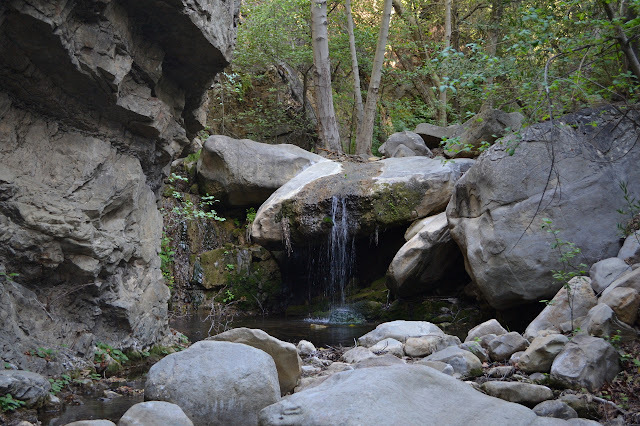 I decided to finally hike this section of Romero and then poke around Blue Canyon. I went for it, as it turns out, on the second day of work on Gibraltar and although I was not "thru" traffic, which the road is closed to according to the signs, they would actually only allow residents through. I headed up the long way, only to find road closed signs at Angostura Pass. 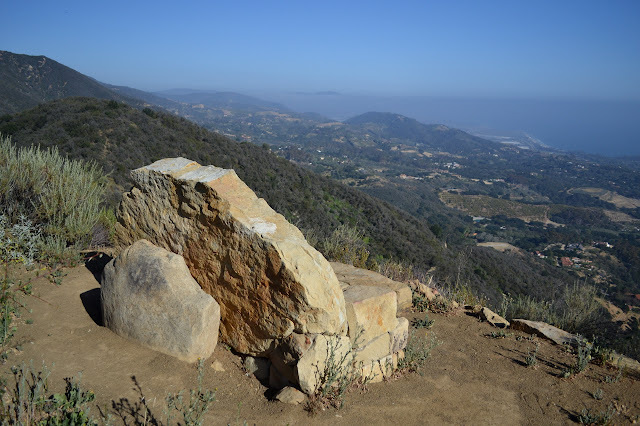 This small section of Camino Cielo apparently is, although not in the minds of the public, also Gibraltar Road. I could probably get away with sneaking past the signs, but decided to just walk Romero end to end. The parking is deserted except for a couple mountain bikers finishing up, but will be difficult to come by in another half hour when the dog walkers and such flood in at 8 AM. The marine layer is keeping things cool, so it is a good day for a climb. Starting off on the old Romero Canyon Road under the fog. 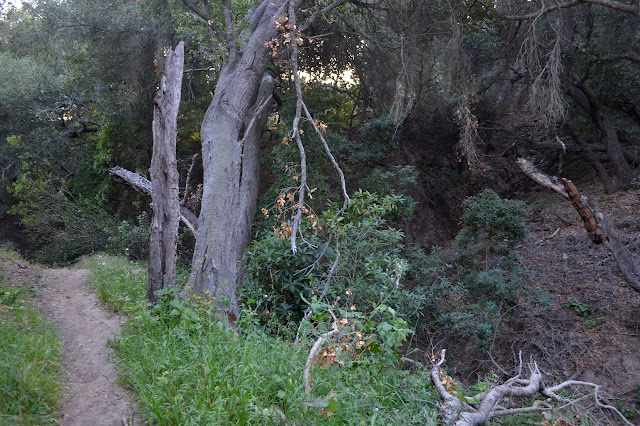 A short way up the road, there is a creek crossing and the trail starts. It is steeper, shorter, rockier, and cooler than the road. There are a few flowers out, some getting a little thin and old. The clouds do not extend all that far into the canyon, and so I leave them behind. Once above them, it feels a like there is a little extra sun, some of it reflecting off the lower clouds. 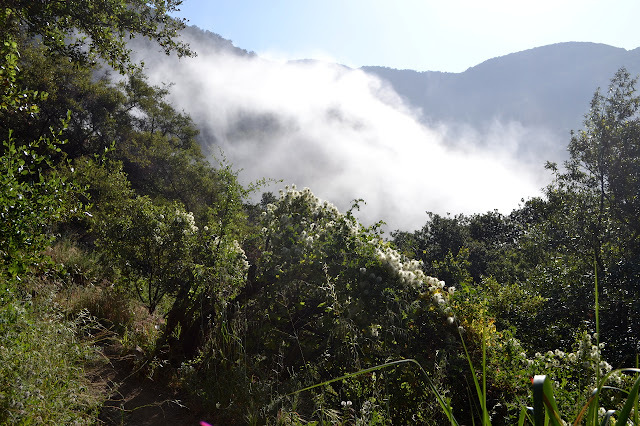 Getting toward the edge of the clouds, a wisp blows past some wispy flowering vines. 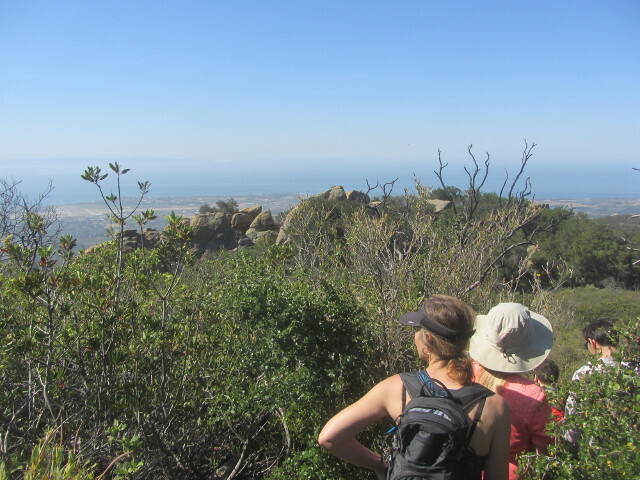 I decided to join the local Sierra Club for one of their organized weekend hikes. They were planning to go along Rocky Pine Ridge, but the closure of Gibraltar meant a change to The Playground. I do not seem to have bothered with The Playground, but everyone talks about it, so it seemed like an excellent way to get an introduction to the area. 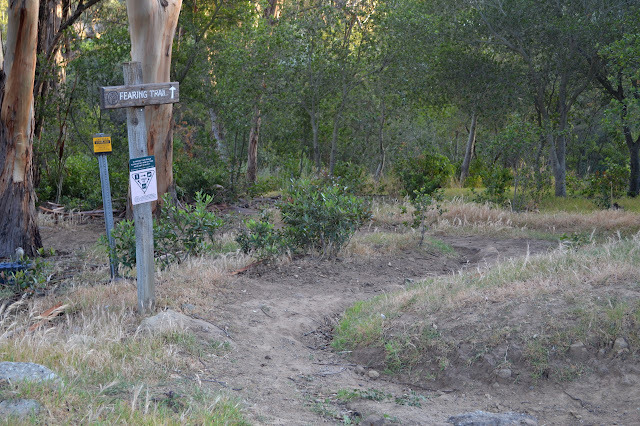 This means meeting at the bank at Hope and State at 9 AM to carpool up to the trail on West Camino Cielo. The trail is only signed by the popularity that produces large turnouts that are often occupied. 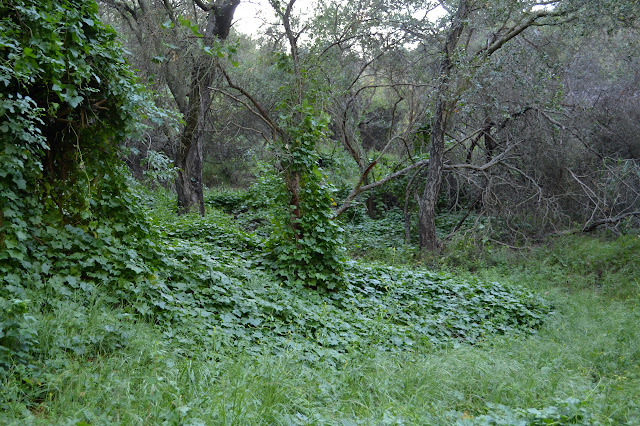 A very distinct track leads into the brush from the largest turnout. There is no jumble of rocks evident as we start into it, and even less so as we drop down into a fragrant, green corridor that closes overhead. 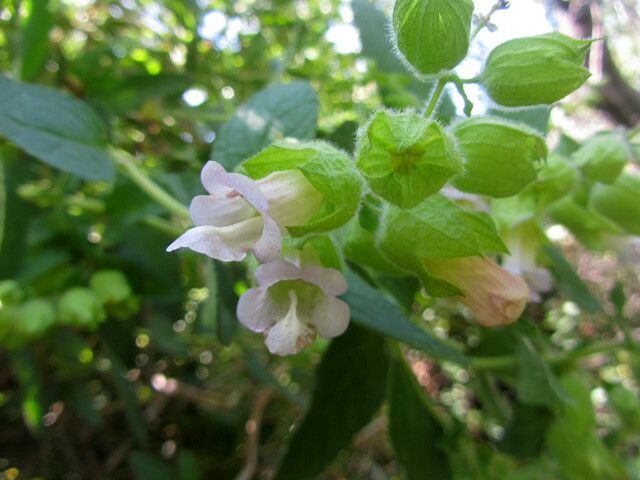 One of the more fragrant plants is currently decorated with very large flowers. A part of the brush tunnel that still allows some light in. No tunnel is unending and the brush tunnel opens up as the area becomes drier. We wind through more brush to a dirt ledge and now rocks are evident. We clamber down steep dirt slope to a flat with trees and behind the trees, high sandstone cliffs with huge overhands and lots of lovely texture. So there are rocks around here. 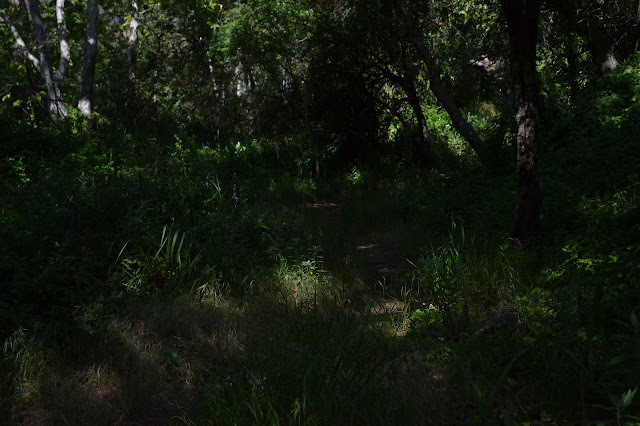 I have come back to this odd little trail to climb a little way in the shade (and a little way in the sun), visit the benches, and play with a couple very basic filters for the camera. 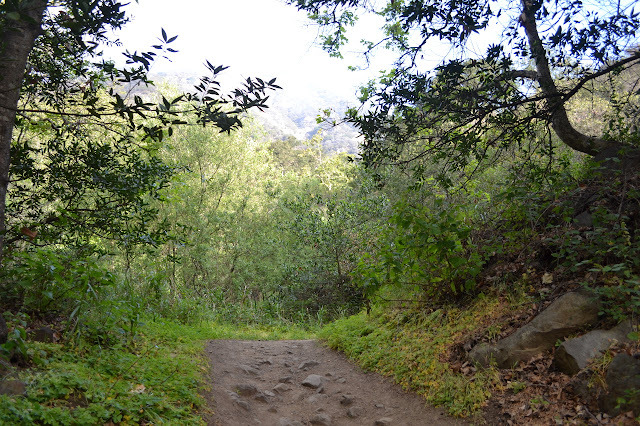 The canyon is nice and shady, the trail as steep as I remember. At first, I think I can hear water, but then notice that the water starts and stops with the breeze. 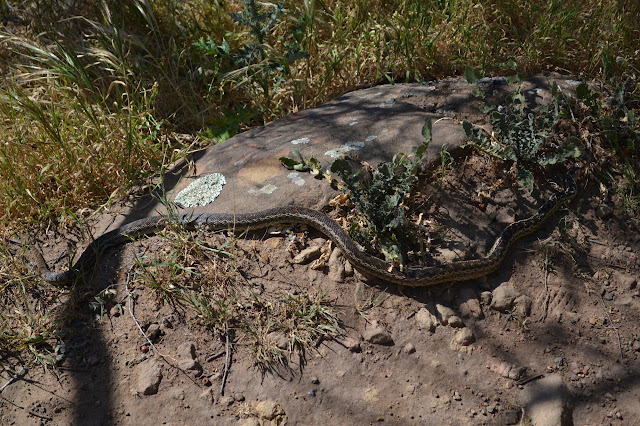 The reptiles are out, like this huge gopher snake. Up past the gaping mouths of carved sandstone. Crossing the dry creek bed. No water here. Shortly before the sign at the trail split, it turns out there is water flowing here after all. It is not much, but it is more than a trickle and does make a delightful sound. 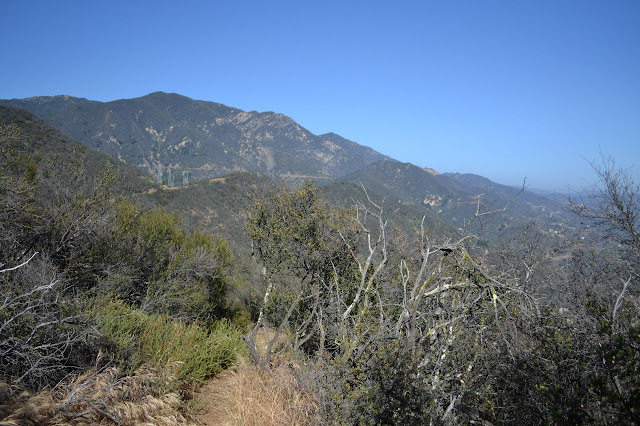 It is also quickly left behind and the trail climbs up out of the canyon to the end of the catway. The middle of the three pronged trail. From here, go up to the Edison Catway near Romero, or the same near San Ysidro, or drop back down to Montecito. Checking out the canyon rim in another poorly executed panorama. 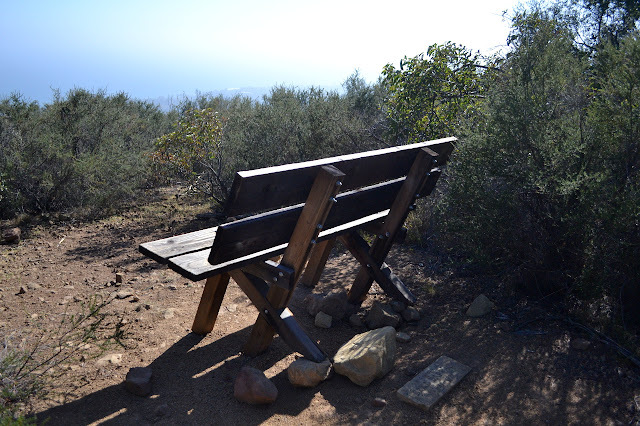 Continuing along the Edison Catway, it is still a little more climb to the spur trail to the wooden bench. This trail seems more open than I remember it. The bench is the same and the brush over the benchmark behind it seems a little more open, but still hides the weathered disk from the casual looker. The air is murky today. 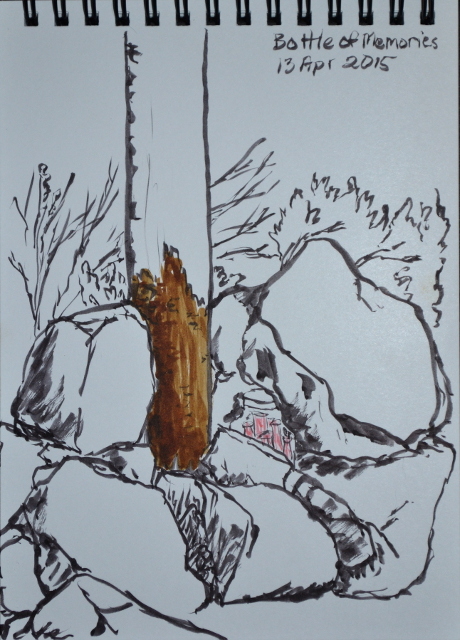 A wooden bench and a memorial stone. It is not the original bench. The BUENA reference mark is still good. Looking down the trail to the bench to Romero Canyon Road carving a way up the far canyon. 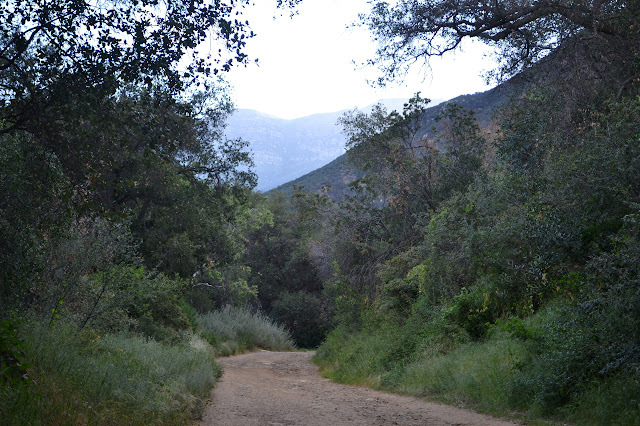 The road rolls a little bit as it goes toward Romero Canyon. The stone bench is on a spur just before it starts to drop into the canyon. 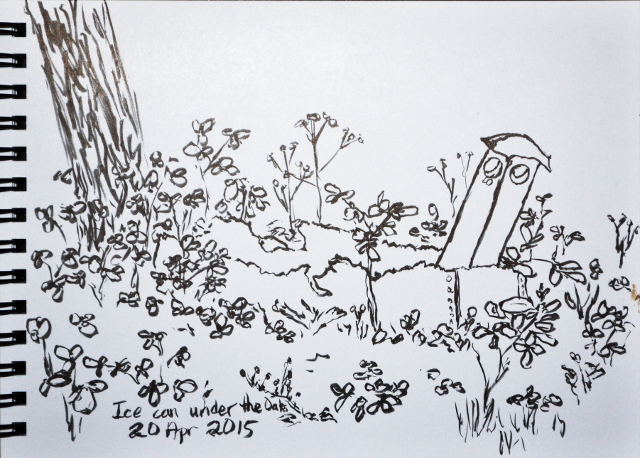 This one is not surrounded with brush, so has always been very open. It seems less steep than I remember. It is here that I play with the new filters, but they do not seem to do much with the murk in the air. So, they are not miracle workers. My initial intent was just to go up and back, but I may as well make a loop of it. The catway becomes steep for short sections as it works its way down toward Romero Canyon. I take a relatively flat spur to one of the power poles to grab a short piece of 7 Trails that is not actually a part of any other trail (at least that is what I have been told this bit of trail is). 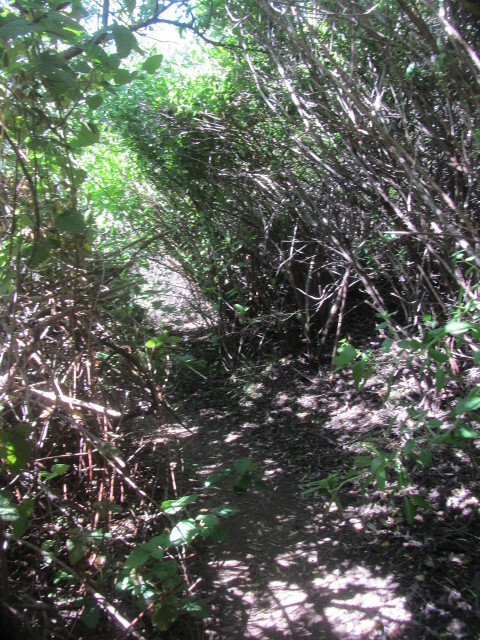 This trail practically jumps off the spur and down ten feet, but afterward resembles a trail a little more closely. 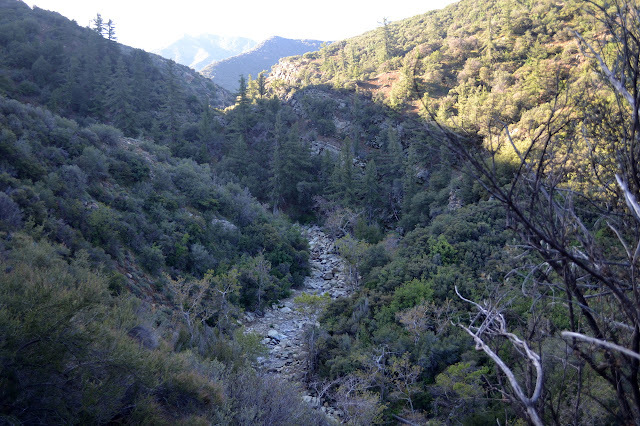 Many short switchbacks and flat stretch carry me down to Romero Creek. The creek has nice flow, much more than in Buena Vista, but it is draining a much larger area. Looking up at the lush growth the switchbacks come down through. The trail crosses the creek at a large rock. The connecting trail reaches Romero Trail just after the creek crossing. This trail drops quickly to the road and the return crossing across the creek. After the crossing, the catway I could have followed comes down. It is just a little further to the paved, public road. Then I have to return along the road, past the mansions with crazy landscaping. Also, it turns out, past the Fearing Trail, which I head down. On the Bella Vista side of the Fearing Trail. 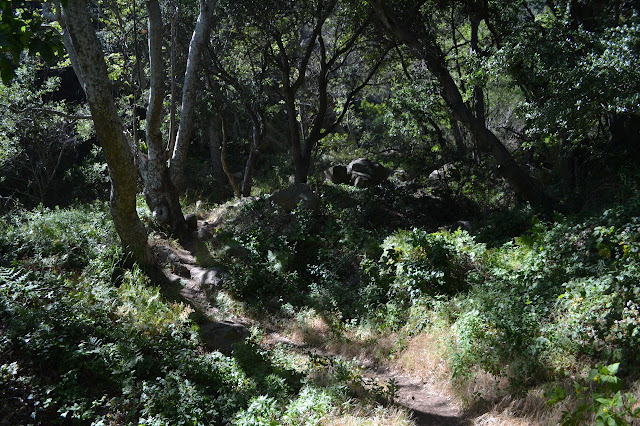 The trail twists around a steep gully, dropping quickly toward the bottom. 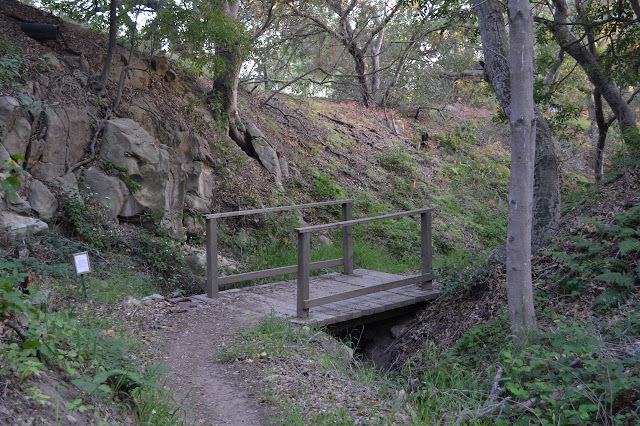 A single bridge is provided, and a poem and seat with it, but the trail crosses the bottom many times below this. Eventually, it pops out on Romero Canyon Road. Trail as it climbs down the steep sided gully at the right. A poem beside a bridge. Just because. 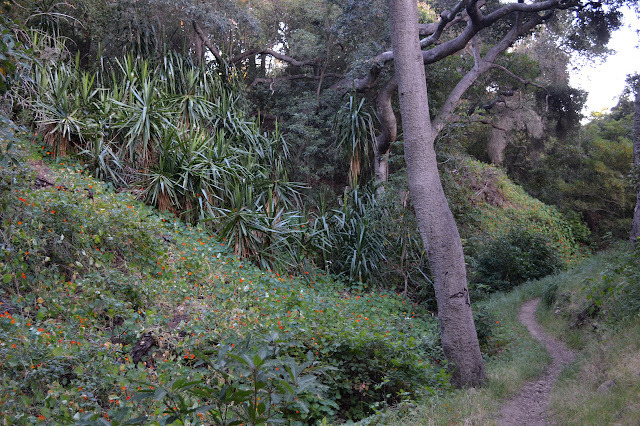 The trail winds near the bottom of the canyon, here past a section thick with garden escapees. 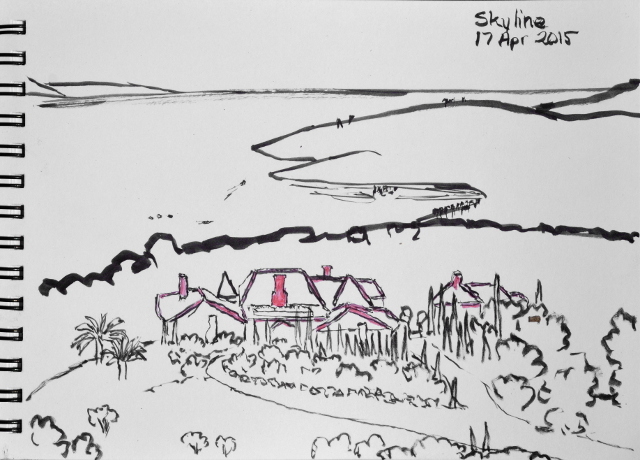 Having reached the end of the trail, there is nothing more for me to do except go back up and pass some more mansions with elaborate landscaping. Heading back up the Fearing Trail. The cold air coming ahead of some Alaska sourced rain seems like the perfect opportunity to do a hike that I think, rightly or wrongly, will be a bit hot. One such neglected hike, for me, is up Sisar Canyon. Near the top of this is a destination that seems a poor one to miss, Topatopa Bluff. Sisar Road turns out to be a single lane private road with sharp speed bumps every 200 feet or so lined with signs imploring the traveler to go 5, 10, or 15 MPH at most. The pavement turns off to the left and a dirt road continues straight. The correct route is the dirt road. Any car can make it a little way up this road to a couple water tanks. Past that, it takes some fancy wheel work to coax a car up and the reward is only to save 0.4 miles. I elect to park and hike it. The air is a perfect temperature for hiking, a little chill for standing around in. Except for four men and a dog and one resident balancing a ceramic mug of caffeine while navigating a particularly rough downhill patch, the road is empty. Sisar Road is tree lined along the bottom of the canyon. The bluff is hard to see in the cloud. 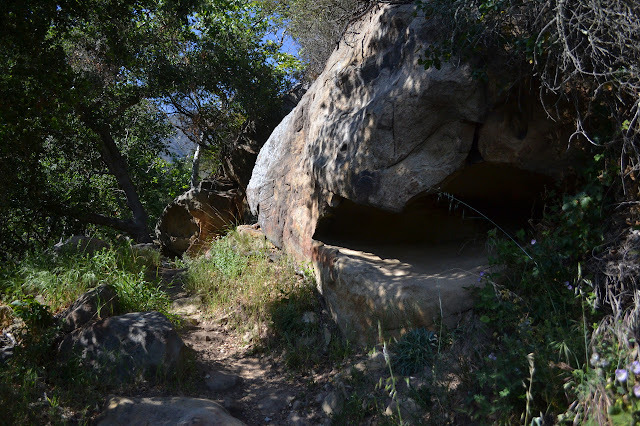 Up a side trail to a dribbling rock in the creek. Initially, the road travels along the bottom of the canyon. The creek below has water and it is nice to hear it flow. There are spots where it goes underground, but then I notice the bird noises increase and step to the side near the water to find it flowing again. There are two crossings that are easy to navigate before the road takes a big turn and starts to climb up, out of the canyon and into the sun. Take a turn and suddenly there are no more trees to protect from the sun.